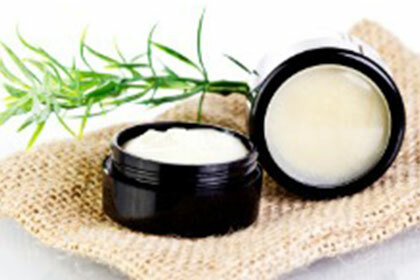 Natural Nappy Rash Balm helps protect your baby’s skin from nappy rash and other skin conditions. HerbsOnlineshop's Natural Nappy Rash Balm is a soothing balm ideal for nappy rash, cradle cap and other skin conditions. It contains chamomile and calendula extracts in a 100% natural lanolin base that nourishes and create a protective barrier on your baby’s skin. This natural nappy rash balm helps protect and soothe your baby’s sensitive nappy area skin. Directions: Apply to dry, clean skin at each nappy change. Tip: To prevent nappy rash, gently pat your baby's bottoms dry after every bath. Make sure they are completely dry before putting his/her nappies (moisture contributes to nappy rash). Also, make sure there is enough room for the skin to breathe - don't put it on too tight, just snug enough to prevent leaks. Use unscented wipes or warm water and cotton balls or a soft flannel to clean your baby’s bottoms. Also, give your baby’s bottoms some nappy-free time.